Herring Is Dedicated to Grease Trap Service that Maintains the Health of Your System and Your Business. 24/7 Service Schedule Availability. How often do I need my grease trap pumping done? Some facilities have to pump as often as every 3 weeks while some can pump every 6 months. Herring will evaluate your system and create a customized, recommended maintenance schedule that will reduce odor, repairs and problems. What can influence your grease trap pumping schedule? The size of the grease trap is very important based on the size of the kitchen, sink capacity and dining room capacity. All of these play a role in determining the pumping schedule. When the town approves the plans for your location with the BOH (Board of Health) the grease trap is usually sized properly. Servicing, however, will be based more on demand on the system. Demand can fluctuate depending on season, business flow and events being held at facility. How can I determine my grease trap pumping schedule? 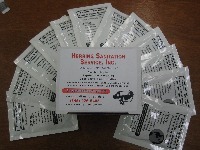 Herring Sanitation initial visit to your site is free of charge. While we are there, we will determine the best pumping and maintenance plan as well as evaluating any repairs needed. We will create a plan based on this site visit. Does my business need to have a grease trap pumping? All interior grease traps and exterior grease traps must be serviced on a regular basis. 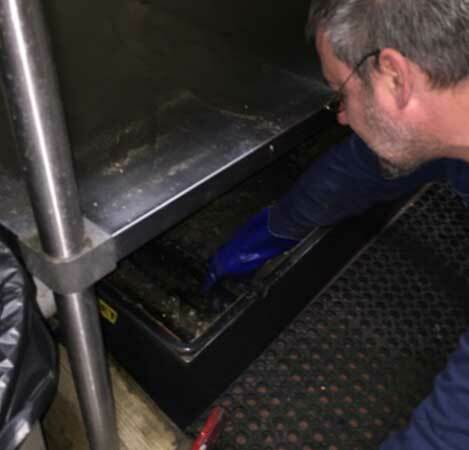 Generally the types of businesses that need grease trap pumping are restaurants, hotels, hospitals, factories, catering facilities and any other food processing businesses. What if I have neglected my grease trap...what can I expect? If neglected too long, grease will solidify and get caked in every line that leaves the building or runs to the grease trap. Once this happens, there is no easy or inexpensive solution. A repair can be costly and can easily reach thousands of dollars in repairs. Herring Sanitation recommends you have regular grease trap pumping to avoid this eventuality. What is Grease Trap FOG? Grease Trap FOG refers to (F) Fats, (O) Oils and (G) Greases. These are the components of cooking that grease traps are used to catch. The FOG can create much havoc when it enters sewers systems, especially as it cools and hardens. According to the DEC's 2014 Design Standard document (D-3): "FOG can cause sewer system blockage as well as treatment unit failure. All facilities that have potential to discharge FOG are required to install a FOG removal device, in accordance with state law." Would grease interceptor additives extend the life of my grease trap and lessen my pumping frequency? According to the DEC's 2014 Design Standard Document (D-12): "Grease interceptor additives should not be used, as some products claiming to “clean” grease interceptors contain compounds which provide temporary relief, but may also result in permanent damage to the disposal field and cause premature clogging." Grease Traps that are not pumped can cause slow running drains, backups, gurgling in your pipes and very bad odors. When grease and debris are left to sit and are not pumped out, grease and rancid oils emulsify and begin to create blockages - similar to cholesterol in your arteries. For more info on this topic - click here. How much will it cost to have my grease trap serviced/pumped? Servicing your grease trap regularly is a lot less expensive than repairing or replacing it. Prices vary based on the size of grease trap and frequency of schedule. We will do an initial maintenance to get your grease trap as close to original condition. And we will recommend schedule and frequency best for your business. And remember to ask for whatever discounts you qualify for.